Jacob is an Austin Native and has been playing around town from a very young age. Jacob took up the drums at age 4 and learned the guitar at age 8. He spent many years studying theory and is on a lifelong journey to perfect his crafts. Jacob is a multi-talented musician with a focus on Guitar, Drums, Bass and vocals. He also has extensive experience as a songwriter and producer on many albums. Jacob toured and played with many successful Austin bands including Monte Montgomery, Rick Trevino, Vallejo, James Speer, Hallow, Derrick Davis Band and most recently is pursuing his own music solo as an individual artist, as well with his side project Untold Sky..
Jacob has played on too many albums to list – just look at the credits of your favorite Austin band and you might be surprised at what you see! The past several years Jacob has been on a journey to share his love of music with the local community and the world. Taking yearly trips to Uganda Africa, he works closely with the African Children’s Choir and with Kids In A New Groove here in Austin. 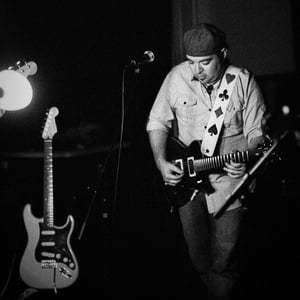 Jacob opened and is currently residing Owner/Director of Rock Lab School of Music in 2015 with the goals and vision of keeping the spirit and love of music alive for many generations to come.